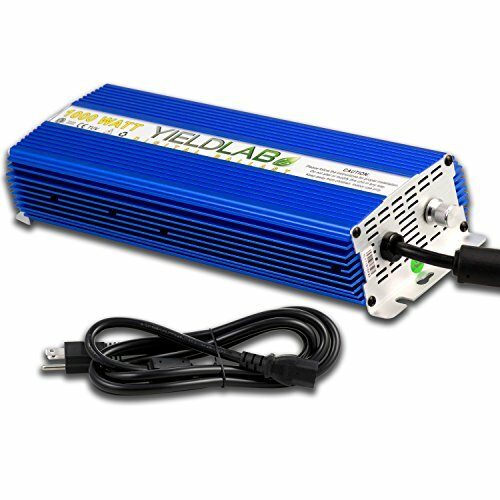 The Yield Lab 1000w Slim Line Digital Dimming Ballast is the premiere e-ballast for your indoor hydroponic needs. With its slim line and dimmable functionality, enjoy a ballast that is built to last and boasts superior quality. SLIM LINE DESIGN: With its compact and light weight design, this ballast packs a punch! With larger heat syncs, larger surface area, and built-in fan this ballast will stay cool and avoid overheating. The ballast also runs completely silent so no more humming or additional noise. In the event of a power shortage, the ballast will also come with a spare fuse so you never have to compromise your grow! SAFETY AND PROTECTION: Enjoy the peace of mind of a safe and certified product. With open circuit protection, short circuit protection, ignition failure protection, and over heat protection this ballast is built to last! Come see and experience the product that boasts UL,CE safety certifications and why many have made the switch to Yield Lab! ADJUSTABLE SUPER LUMEN BALLAST: Featuring Dimming Control you can effectively reduce lumen intensity as much as 50%. Utilize the Super Lumen Function to boost your output by 15% for later flowering stages. Experience the quality of industrial grade internal components that provide stead power, increased PAR, eliminates flicker and boost yields!